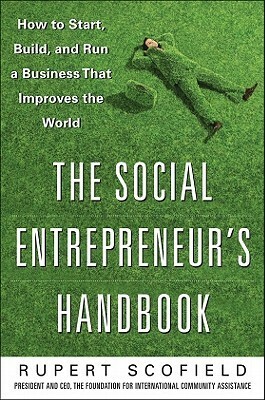 When I started reading this book, I thought "Oh, another I'll-tell-you-all-the-truth-about-social-enterpreneurship lightweight book with no added value." For some reason, the first pages seemed to be this way: the ideas and the principles were too generic. But then, the more I read, the more I understood there's something to learn from. And I guess, this real-life experience of the author, the experience of managing a big international social enterprise is what makes this book valuable. You can find a lot of strategic and tactical wisdom in it. A good book about making a positive social impact on the world via starting, running, and participating in a non-profit. The book was both tutorial and an extensive example from the world of microfinanced loans, specifically in developing countries. I enjoyed the tutorial aspects of the book and would have preferred less focus on the specifics of the microfinance industry (and the author's entity, FINCA International). Although the stories relating the tutorial/lessons to FINCA added to the educational value, I nearly put the book down a number of times because I have a different path of social entrepreneurship to follow. The author could have done a better job of focusing on the reader, whereas I felt like this was more of a "look at what I did" approach. It was still a decent read, but I only finished it because I was up on my maximum of 8 checkouts from the library. This book is kind of like Hilary Clinton, it may have lots of good things to say, but I found myself easily distracted by nearly anything else. Are you willing to give up your corporate job and work for a non-profit? Well Scofield did just that and now he is sharing the how-to-do and still get paid. There are three clear things you need to know: discover your passion, identify your constituency and find a mentor. This isn't anything new but Scofield's presentation is awe-inspiring. The swags, the careful descriptions, and the ideas of how he navigated the hardships of fund raising will intrigue you. While this book has basic business 101 concepts it is dry and very technical in parts. There are clear descriptions for effective leaders, how to manage difficult people and how to predict funding downturns. I recommend this for everyone wanting to move their passion into a business that helps the masses. Very good book, but not quite what I was expecting or looking for. If you're just getting started at social entrepreneurship, there's not a lot here. The author basically says to get your several years of poverty experience and then quickly moves on to intermediate/advanced stuff about building a large organization. While this was interesting and informative, it seemed like things that I'm years away from thinking about. Excellent and honest advice for social enterprises and nonprofits. Rupert Scofield has a gift for storytelling, which makes this handbook an easy read. Some helpful tips to learn how to make a living while changing the world.